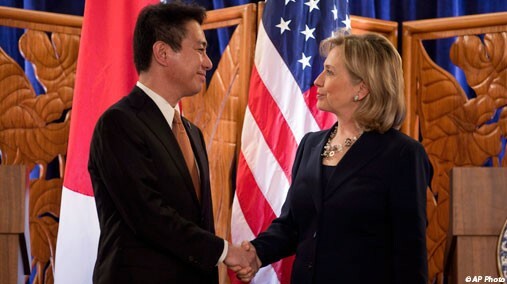 SECRETARY CLINTON: Well, first let me say clearly again that the Senkakus fall within the scope of Article 5 of the 1960 U.S.-Japan Treaty of Mutual Cooperation and Security. This is part of the larger commitment that the United States has made to Japan’s security. We consider the Japanese-U.S. alliance one of the most important alliance partnerships we have anywhere in the world and we are committed to our obligations to protect the Japanese people. However, the truth was that the diplomatic authority of Japan, in cahoots with other nations, tried to create noises on the issue of the Diaoyu Islands in the East China Sea in the lead-up to the summits between ASEAN and its partners. On top of that, during the summits, the Japanese side frequently made use of media outlets to make statements and comments that violated the sovereignty and territorial integrity of China, Hu said. The Chinese probably considered the statement a double slap in the face because only one day previously Maehara had been in Hanoi making happy talk with Chinese Foreign Minister Yang Jiechi. 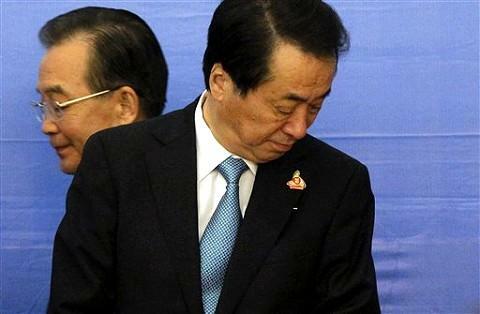 "I believe it is likely that the leaders of China and Japan will hold a meeting here in Hanoi." Amid the diplomatic rubble, the Chinese presumably took some satisfaction in demonstrating that Maehara--a China hawk detested by Beijing--has nonexistent powers of diplomatic prognostication vis a vis China. What has the Chinese really upset, I would imagine, is that China was hoping that Sino-Japanese relations could tend toward normalization on a bilateral basis. "Bilateral", of course, always has a whiff of "divide and conquer" in Chinese diplomacy, as in China trying to convince Japan its best interests lie in occupying a middle ground in Asia, rather than lining up as a U.S. strategic ally against China. Clinton's statement formally multilateralized the Diaoyutai/Senkaku issue by explicitly placing the Senkakus in the scope of Article 5--something that the Obama administration was previously loath to do. Also, Clinton's statement may perhaps embolden Vietnam to cobble together a united front to confront China over the Paracels. From the Chinese point of view, perhaps there seemed to be little point in meeting with Prime Minister Kan--whose enthusiasm for confrontation over the Diaoyutai/Senkakus is apparently somewhat more tepid than Maehara's--and having their nose rubbed in the fact that the U.S. had chosen to line itself up with Japan formally on the issue. Also, China is trying industriously to drive a wedge between moderates and China hawks in Japan. Their efforts might get some purchase as Kan reflects that, in a remarkable coincidence, Foreign Minister Maehara managed to make the most important Japanese foreign policy statement over in Hawaii just in time to scupper Kan's get-together with Wen Jiabao in Hanoi. Photographs of Kan and Wen and Maehara and Clinton shown at the top of the post provide an interesting juxtaposition of images. China Friday voiced concern over and strong dissatisfaction with U.S. Secretary of State Hillary Clinton's recent remarks concerning China's Diaoyu Islands. "The Chinese government and people will never accept any word or deed that includes the Diaoyu Islands within the scope of the U.S.-Japan Treaty of Mutual Cooperation and Security," said Foreign Ministry spokesman Ma Zhaoxu. It is hard to imagine any magical emollient oil that Hillary Clinton will be able to apply to Sino-American relations during her visit with Dai Bingguo in Hainan. It is probably clear to Beijing that Chinese opinions on matters of equity and interest, and the possibility of Chinese economic or military retaliation, apparently do not concern the United States very much. For the Chinese leadership, which has seen the PRC's international standing drop from respected superpower to virtual pariah in less than a year--and the diplomatic environment for sanctioning China on its currency becoming ever more favorable--the U.S. willingness to go to the mat for Japan on the Senkaku/Diaoyutai islands provides a lot of food for thought. Also, I wish to issue a mea culpa. I am willing to grant that China disrupted rare earth shipments to Japan over the Diaoyutai/Senkaku incident. That's a distinction I should have made in my Asia Times article, Japan spins the anti-China merry-go-round, and I regret not doing so. Given the quota system/smuggling structure of China's rare earth trade, it would be easy to slow or stop exports simply by ordering heightened vigilance by customs, perhaps with the instruction that the validity and authenticity of export documentation such as licenses had to be reconfirmed at a higher level. Keith Bradsher's article in the October 28 New York Times provides a detailed and plausible picture of a slowdown in Chinese rare earth exports. The purpose would have been to send a pointed rebuke to Maehara, point out to Japan's business community that Maehara is not the best steward of Japan's relationship with China, and remind Japan that business with China is as important as Japan's security relationship with the United States. In other words, a discrete use of enforcement power to send a message of dissatisfaction, not an embargo that could be construed as a violation of WTO regulations, damage China's image as an exporter, or threaten Japanese industry (given the significant stockpiles it holds), let alone a declaration of economic war against the West using rare earths as a weapon (considering the inevitable and expected entry of non-Chinese producers into the market as most of Chinese rare earths disappear into Chinese end-uses and exports dry up). Of course, the effect was the exact opposite. Maehara skillfully parried an attack on his brinkmanship over Diaoyutai/Senkaku and repurposed and escalated it into declarations of a Chinese attack on Japan, Europe, and the United States; and the U.S. government and the Western media dove in. The point of my article--that the rare earths issue has been knowingly, dishonestly, and cynically inflated into an incident of anti-Chinese hysteria--still stands. But it would have been a better article if I had addressed the Chinese action that probably triggered the firestorm. With all these statements from Chinese Foreign Ministry and the demonstration in China against Japan, no Japanese Prime Minister can afford to be moderate in the Senkaku issue. And the Japanese people thanks the Chinese government for cornering their PM into a hardliner. What a great post! Offer you for sharing it on your site.I’ve been visiting your blog instead of a while conditions and I as a last resort summon up a marvel in your recent posts. Thanks for sharing. It's a good topic ! I am glad I was able to read it.Brilliant post Harry! Evening dresses What you have shared to us is interestingEvening Dress! Xie Chaoping's "The Great Relocation"